Ferguson Bath, Kitchen & Lighting Gallery beautifully displays lighting, appliances, and bath and kitchen products from today’s top brands. The state-of-the-art showroom takes the experience even further and allows you to touch and feel the products in a welcoming, hands-on environment. From exquisitely designed bathroom displays with functional showerheads, to full kitchens with working appliances, you can explore a variety of design styles. Ferguson’s wide range of products lets you make multiple selections at a single showroom, which streamlines budgeting and makes the building process more efficient. 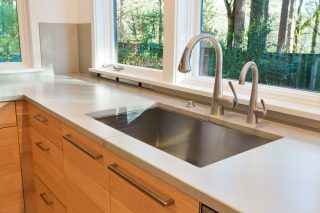 Not only does Ferguson offer traditional plumbing products, but they also offer lighting and high-quality appliances from cooktops and ranges, to refrigerators and outdoor grills. Ferguson Bath, Kitchen & Lighting Gallery – Now Open!